The fossil was from Pappochelys rosinae—a shell-less ancestor of modern turtles. The Triassic period creature was excavated back in 2015 along with 20 others of its kind from a limestone quarry near a town called Velberg, in Germany. The researchers suggest they likely looked more like iguanas than modern turtles. Since that time, all of the fossils have been stored at the State Museum of Natural History in Stuttgart. 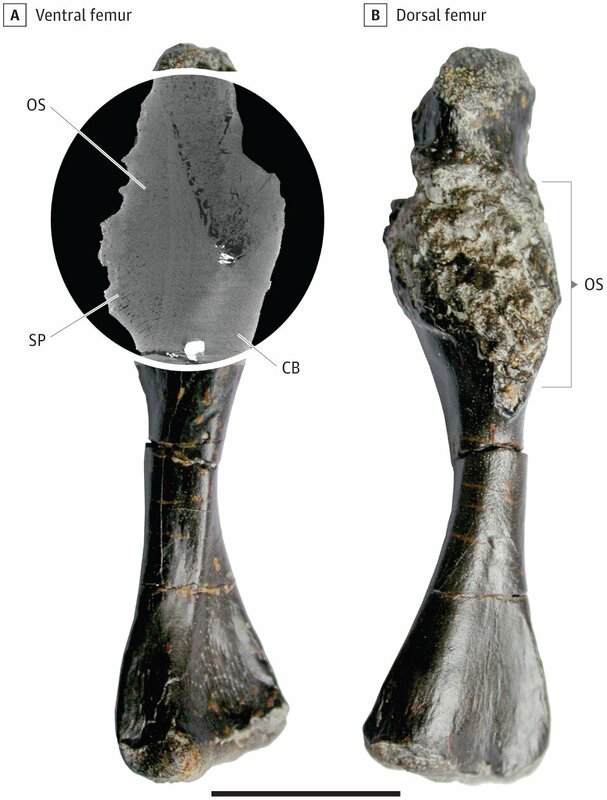 But one of them was clearly different from the others—it had a large bone growth on a part of its thigh bone (femur). The researchers proposed various theories to explain the growth, but it took the current research effort to nail down what the growth actually was—a periosteal osteosarcoma—one that the team describes as looking "almost exactly like osteosarcoma in humans." Evidence of cancer in fossils is rare, because cancerous tumors usually occur in soft tissue. And the kind of cancer found in the fossil was even more rare—just 800 to 900 human cases are reported each year in the U.S. That makes the fossil studied by the team in Germany a truly unique specimen. In order to make the diagnosis, the researchers first had to rule out other possible causes of the bone growth, such as an infection or another disease or injury. Eventually, they subjected it to a micro-CT scan to better examine what was inside and beneath it. That led them to the conclusion that it was a form of bone cancer. The researchers note that because evidence of cancer is so seldom observed in the fossil record, some in the field have questioned whether it was prevalent or even occurred in creatures from millions of years ago. Finds like the turtle offer more evidence that cancer has been around for a very long time.